New coverage of Ultra-High Pressure (UHP) fire pumps makes the 2016 NFPA 1901: Standard for Automotive Fire Apparatus essential for manufacturers as well as fire departments nationwide. Referenced by fire departments throughout the United States, the NFPA 1901 defines the requirements for new automotive fire apparatus designed to be used under emergency conditions for transporting personnel and equipment, and to support the suppression of fires and mitigation of other hazardous situations. This Standard covers everything from pumpers to aerial fire apparatus to special service apparatus, such as rescue vehicles and haz-mat vehicles, as well as quints and mobile foam apparatus. It's a vital resource for everyone in the process -- from design to purchasing of engines, pumpers, trucks, ladders, tender/tankers, and more. A new chapter on Ultra-High Pressure (UHP) Fire Pumps and Associated Equipment reflects the increased use of UHP Fire Pumps with a rated discharge pressure of 1100 psi or greater. This important addition provides first-time guidance to manufacturers and purchasers for the design, testing, and performance of this technology. 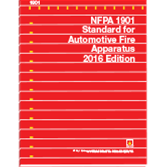 Interested in other editions of the NFPA 1901? Use the drop down menu above to select the edition year you need. 4.2 Requirements by Apparatus Type. 4.3 Responsibility of the Purchaser. 4.4 Responsibility of the Contractor. 4.7 Third-Party Certification of Test Results. 4.8 Manufacturer Certification of Test Results. 4.20 Data Required of the Contractor. 5.8 Equipment Supplied by the Contractor. 6.8 Equipment Supplied by the Contractor. 7.8 Equipment Supplied by the Contractor. 8.8 Equipment Supplied by the Contractor. 9.8 Equipment Supplied by the Contractor. 10.8 Equipment Supplied by the Contractor. 11.8 Equipment Supplied by the Contractor. 12.2 Engine and Engine System Design. 13.13 Stop, Tail, and Directional Lights. 13.14 Electrical System Performance Tests. 15.6 Pump and Plumbing Access. 15.7 Stepping, Standing, and Walking Surfaces. 15.8 Access Handrails or Handholds. 15.11 Requirements for Mounting of Ground Ladders. 15.12 Receivers and Anchors for Rope and Removable Winches. 16.2 Design and Performance Requirements. 18.5 Mobile Water Supply Apparatus. 18.6 Water Tank Capacity Certification. 19.3 Aerial Ladder Rated Capacity. 19.4 Aerial Ladder Operating Position. 19.5 Aerial Ladder Operating Mechanisms. 19.6 Aerial Ladder Water Delivery System. 19.8 Elevating Platform Rated Capacity. 19.9 Elevating Platform Operating Positions. 19.10 Elevating Platform Operating Mechanisms. 19.11 Ladders on the Elevating Platform. 19.12 Elevating Platform Water Delivery System. 19.14 Water Tower Rated Capacity. 19.15 Water Tower Operating Mechanisms. 19.16 Water Tower Water Delivery System. 19.23 Instruction Plates and Signs. 20.2 Requirements by Type of Foam Proportioning System. 20.3 Design and Performance Requirements of a Foam Proportioning System. 20.4 Controls for Foam Proportioning Systems. 20.5 Foam Proportioning System Pressure Gauges, Flowmeters, and Indicators. 20.6 Atmospheric Foam Concentrate Tank. 20.8 Pressure Vessel Foam Concentrate or Foam Solution Tanks. 20.9 Labels and Instruction Plates. 20.10 Foam Proportioning System Accuracy. 21.5 Compressed Air System Piping. 21.7 Foam System Pressure Gauges, Flowmeters, and Indicators. 21.8 Labels and Instruction Plates. 22.4 Power Source General Requirements. 22.5 Power Source Type Specific Requirements. 22.7 Line Voltage Supplied from an External Source. 23.6 Command Working Surfaces and Countertop. 23.7 Seating in Command Center. 23.8 Cabinets and Equipment Storage. 23.9 Wall, Ceiling, and Floor Surfaces. 23.10 Communications and Electrical Consoles. 23.11 Computer Equipment and Installation. 23.12 Video Equipment and Installation. 24.2 Provisions Applying to All Air Systems. 24.9 SCBA or SCUBA Air Cylinder Fill Station. 24.12 Low Pressure Utility Air Supply. 24.13 Remote Breathing Air Systems. 24.14 Breathing Air System Testing and Delivery. 24.15 Utility Air System Testing. 25.2 Winch Wire or Synthetic Rope. 26.4 Information Labels and Instruction Plates. 26.5 Fluids and Pressures Specific to the Trailer Chassis. 26.10 Low Voltage Electrical Systems and Warning Devices.